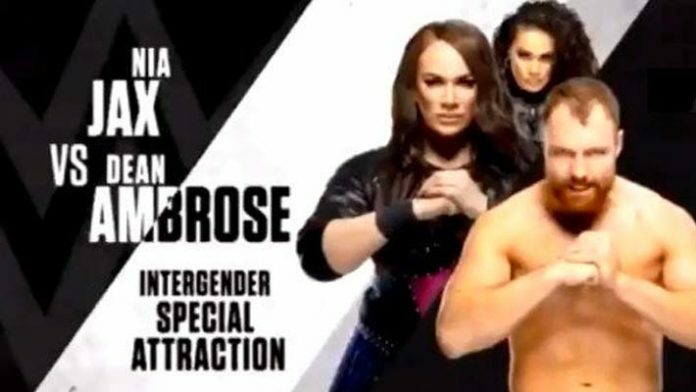 As we reported recently Dean Ambrose will be taking on Nia Jax at an upcoming WWE Live event. The ‘feud’ between the two started on a recent episode of WWE RAW, where Ambrose lost to Seth Rollins. After the match, Ambrose began to cut a promo in the ring before being interrupted by Nia Jax and Tamina. The two had a standoff for a brief moment, before Ambrose attempted to leave the ring. However, Jax clocked “The Lunatic Fringe” with a forearm and sent him through the ropes and out of the ring. The announcement of the intergender match has caused a huge buzz. Before Jax’s involvement in the recent Men’s Royal Rumble there was absolutely no chance of seeing male and female Superstars facing off like this. The only recent exception was seen at last year’s WrestleMania, where Ronda Rousey took on Triple H to a huge response from the crowd, this came during a mixed tag match. It is not confirmed if we will see the match on television or if it is being kept exclusively to this Live event. There have been recent rumors that WWE are potentially considering putting this match on the WrestleMania card.